I have never been very keen on heights: I have to tell myself to breathe and climb steadily as I go up ladders or, indeed, on ski lifts. Much to my surprise therefore, I remained remarkably calm as I climbed a very long ladder to look at the restoration work currently being done on an ancient barn on the Estate. So many visitors and guests admire the Castle, its setting, the landscape and gardens, yet that only represents a proportion of what Geordie and I are restoring and sustaining. This is not a “normal” investment with a chance of a revenue stream, but an investment in supporting our visible history – a sort of journey in life and a love of a place if you like. This most extraordinary medieval barn is perhaps our biggest challenge yet. It is like a cathedral and the dendrology tests suggest it was last rebuilt in about 1450. 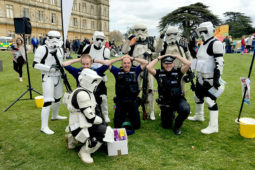 The footprint has an unusual width as well as length and it’s possible that the Bishops of Winchester, who owned Highclere for 800 years, likely employed carpenters who were also working on jobs in Winchester Cathedral and in colleges in Oxford which would account for this. I find the principles and construction of the barn utterly fascinating. It has 8 bays with great oak trusses which span the width with king posts at either end and queen posts which link to the curved trusses thus creating the shape of an arch, whose compressive stress gives maximum strength and support to the building. High up in the roof every truss is notched ready for a purlin but left unused which suggests that the foreman and carpenters changed their mind and divided the top supports into thirds rather than halves to use two levels of purlin support. The result is a cathedral like interior which maximises space. I suspect the barn replaced a smaller one which had been there already. This had always been the main area for farming enterprise at Highclere. In 1348, and then again in 1361, the English population was decimated by the plague which swept through Europe and across the English Channel. Whole villages around Highclere disappeared altogether and, due to the resulting lack of manpower, some field s ceased arable production and very little building work took place. Fields re-organised and new tenants found, just 70 years later, in the 1430’s, a further crisis occurred with another outbreak of the plague and a series of hard winters. Wheat, barley and oats were scarce, prices steadily rose and thus storage became ever more important. Given that tenants remained hard to find, the Bishop of Winchester took back responsibility for the buildings and they carried out some inward investment. Manor Farm Barn was rebuilt. Nearly 600 hundred years later we are again restoring it, augmenting the trusses, leaving visible the structure, using oak as needed, and marvelling at our predecessors. It is a great project. Climbing down from my ladder and carefully not walking underneath it, I suppose I am a bit superstitious. So were our predecessors and we have found at least two witches marks. One is clear to see near a door to stop any bad spirits coming in. They are supposed to have been so transfixed by their eyes by following the never-ending circles that they cannot enter. Now the restorers have strict instructions to look out for other ancient graffiti and we are back to my favourite subject; history! Thank you for posting the photos and detail about the restoration. When the restoration has been completed, will the public be able to see it during the Highclere tour, or is it too far removed from the Castle? I hope you commission a documentary about this restoration. Would love to see the whole process (like Time Team!). I enjoyed this history lesson! You certainly have a treasure . Thank you for sharing! It is so fascinating I could write a book…!!!! History! I love it as well. We moved from a very old area of the US to a newer area, and I actually gave History withdrawal. I sometimes have to go find something old to investigate! Thanks for sharing. Love the hat btw. Oh, I’m going to seem like a skoolmarm if I continue directing folks towards educational videos, but?…..
You lived in York? Here’s a fascinating video I came across two nights ago (the same night I found the video on the restoration of Ightam Mote). It’s about the restoration of the stained glass at Yorkminster. I’m boggled by the patience displayed by the folks doing the work; I haven’t got the discipline required to spend ten minutes sewing a patch on a pair of work-pants. Thank you for this video link. It was highly interesting. I have done a video too which should have been uploaded at noon and am waiting for the we company so to do! I hope you will find it interesting. Have you seen this fairly fascinating documentary on the restoration of Ightam Mote and its many (to say the least) ancient beams? I came across it just two nights ago. By the end of the piece, you’ll fully understand how someone could spend ten million pounds (yes…..ten million) restoring a 600 year old house. For years, I had an art exhibition each Spring at La Grange de Meslay…….an ENORMOUS,15th century barn (stone foundation and walls, trussed roof) which sits outside of Tours. Ironically enough, all the other monastic/ecclesiastical buildings around it have long disappeared, ending with the bishop’s residence, which was blown up by retreating Nazis in 1945. These days, the grange/barn just sits like a huge, stranded ship in the middle of the fields. Since the sixties, it’s been the home for a yearly classical music festival that was started by Stanislav Richter…..so, it has a whole new life. many thanks for the link to the restoration of the window at York minster, it is fascinating, like you, I wouldn’t have the patience to do something like that, I must say, if you ever get to England, York is well worth a visit, especially the Minster. My favorite subject, too! Thanks for including the photos especially the witch’s mark – fascinating. I grew up on a farm with a much, much, much(!) smaller barn where we kept our cows, hay, and chickens. It’s hard to imagine such a grand space as your barn-cathedral being used for such mundane things, back in its day. I’m curious as to your plans for the space after restoration. I can see it being used for beautiful rustic balls and galas! Extraordinarily interesting! I shall watching the progress with great interest. I have friends here who do vintage building with ancient tools. They will be very interested, too, and I am passing this on to them. Best success with your new project. Puna Juaj meriton vetëm të lavdërohet për qëllimet e larta që i keni vënë vetes tuaj. Ruajtja dhe kujtimi i të kaluarës historike ka vlera të mëdha njohëse dhe shkencore. Familja Herbert – Carnarvon ka dhënë një ndihmesë të çmuar edhe në çështjen shqiptare e Shqipërinë, shtetas i të cilës unë jam. Unë po përpiqem që të mbledh fakte pwr Zonjën e nderuar Elizabeth Carnarvon (1856-1929) dhe mikun e madh të Shqipërisë Aubrey Herbert (1880-1923). Për këtë po punoj. Edhe njëherë ju urojmbarësi në jetë. Your job deserves only to be commended for the high goals you set yourself. Preserving and remembering the historical past has great cognitive and scientific value. The Herbert-Carnarvon family has also made a valuable contribution to the Albanian issue of Albania, of which I am a citizen. I am trying to gather facts about the Honorable Lady Elizabeth Carnarvon (1856-1929) and the great friend of Albania Aubrey Herbert (1880-1923). For this I am working. Once again I wish you good luck in life. I know a little about it all as it played a part in my Lady Almina book. One of my predecessors, Elsie Carnarvon, set up hospitals in Albania in memory of her son Aubrey Herbert. he was such an extraordinary man, a brilliant, brave and generous maverick. I laughed and cried with him whilst writing my book. He spoke Albanian and spoke for Albania is 1919 and was offered the crown of Albania. (He sent a telegram to his brother and asked shall I accept? “No stop Carnarvon” came the reply. This is one of your most fascinating post yet for I share you deep love of the historical story of place. It takes time and effort devoted by you to bother to write and share these stories, so with warm heart, I thank you for your willingness. How fascinating…nothing captures my attention like history and it’s preservation. Here in the “young America” we are taking monuments down because they might offend people, and far be it, we wouldn’t want to be offensive, so we try to change our history. There, history is looked after and preserved. Thank you for being a preservationist! Here in Tulsa, we finally found something to preserve, our Route 66 buildings and signs are being restored and people are noticing. Our downtown has had a resurgence of energy and awareness, this is exciting to me. Thank you again for blogging your life’s work. I hope that buildings and lives are allowed a longer “innings ” in the USA – that people in 150 years time can look back and look after older buildings. Thus comes greater understanding. Back in the late 70’s the Tulsa Junior League compiled a wonderful book on the Art Deco buildings here in Tulsa. I believe our interest and work on compiling that book led to a greater understanding and appreciation of these beautiful buildings and perhaps saved many of them from being demolished. West Virginia. The contractor told why the beams were larger in the middle and tapered to lesser inches at both ends. You have done the same in discussing load bearing and distribution of weight. The barn in West Virginia was three stories which appears to be somewhat the same size as your historic barn; however, the W. Virginia barn was totally dismantled and taken to Arizona to be reassembled for a private owner’s family social center. No supports in the middle of the building thanks to the major support system. What a wonderful coincidence. Thank you for these interesting pictures. Also, I recently returned from the June World Flower Show in Barbados (the WAFA show) where two of the amazing floral designers were from the UK. We (four ladies)spent two days in the demonstration programs and the events were well worth the effort and expense. Watching Craig Bullock and William Dixon from the UK was amazing. We also participated in demonstrations by Marie Francoise Duprez from France. I feel certain you know these names well. One engaging time was meeting and connecting with 71 UK visitors to Barbados coordinated by flower show judge Michael Bowyer who became a wonderful friend to these four southern “Yanks” in Barbados. Thank you for your marvelous postings. And thank you for preserving the history of your country. We here in the USA tend to tear down and pave over. So sad ! I think we know no better than our ancestors. I am so glad you love history–I do too! What joy for you to live on such historical property. Every day there is room for discovery so you get a glimpse of the past! Thanks so much for sharing with pictures and narratives! I visited in 2015 & had lunch there, & it was an amazing experience! Happy exploring!! It’s interesting that Barn building hasn’t changed for centuries, until recently. The barn on our dairy farm has much of the same design and was built in 1850s. Today we tend to build pole barns. A much different and cheaper way of building. I love the estate at Highclaire and wish I had the chance to visit. I have a Victorian estate and also a farm with 3500 acres. Just a small version of your estate. Farming still supports the land and buildings here. I can only imagine your estate in full operation in the old days. Farm, cooking, families – that was how we started and whilst I try not to have a “mission” , part of the drive behind “At Home at Highclere ” is field to table, seasonality … it is circling theses themes and I think any book has to have a drive behind it or you do not hit the deadline!!! The Witch Mark is quite fascinating. This is the first I’ve ever heard of them (being in Canada) so I did a google search and found out that “Historic England” (https://historicengland.org.uk/historicengland/) is asking people who find the marks on non-religious buildings to let them know. Here’s an article in the Guardian about it. Seeing that mark, put there by a real person hundreds of years ago makes you wonder: how much of what we now consider superstition has it’s origin in someone’s real-life experience? That they can design and construct that barn and at the same time be convinced of the value of protecting it from evil spirits creates a truly fascinating dichotomy. For us not able to get to see such wonder, I truly appreciate your blog your Ladyship. I have been inspired by you and his Lordship, and am attempting to restore my home and property. Alas it’s new by British standards having been built on 1940. Wonderful post! I must chime in, too, to express my gratitude to you for taking the time to share all the fascinating projects around your home and grounds. Thank you so much! Thank you and your husband for working so hard making sure history is carried forward. You both are good stuwards. I enjoy all of your posts. You are leaving posterity with great history. Thank you – I think we try! I love seeing this interesting lesson in restoration. I visited Highclere in 2014 and admit I was so entranced with the castle I didn’t see other buildings. Your photos give me a deeper appreciation for how you are caring for your beautiful estate. Thank you so much for sharing this process! It’s wonderful to see the history of your lovely lands being so well cared for. I’m Soo looking forward to visiting Highclere on my next trip to London! Huge Downtown Abbey fan! care and restorations that you undertake throughout the Highclere estate. You love the history of the buildings as well as the people that are at Highclere. The oak is so lovely, so old, and so strong after centuries! May the barn “cathedral” become a venue for concerts, events, wonderful gatherings in a warm and elegant environment. It is amazing but i think will never be warm!!!! It is England with British weather !!!! However I find it inspiring. I love how you said “supporting our visible history –a sort of journey in life and a love of a place” Love history and how lovingly you are restoring and researching at the same time – your life is filled with wonders! Keep it coming!!! 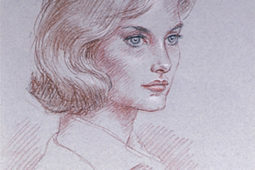 Thank you – it is a journey and Highclere is an anchor. I could spend all day just checking out that barn – I absolutely love restoration work, especially on barns. I lived in an area of Pennsylvania with a lot of huge old barns, many of which were built by the Amish and Mennonite communities in York and Lancaster counties. The barn-raising tradition in those communities is something to witness. I’ve never seen it up close myself, but I did see a few in progress as I would travel with my family along the back roads when we were on our way somewhere. Of course, even the oldest of those Pennsylvania barns is quite a youngster compared to the one you told us about here! Isn’t the scale and workmanship just breathtaking? Your mention of witch marks reminds me of the hex signs that are common on those Pennsylvania barns… they served the same basic function – to keep the evil eye off the barn and the animals within. Thank you for working so hard to both restore and preserve a very valuable part of Britain’s history. Living in the USA, we have nothing to compare to your lengthy history, but many of us do treasure and try to preserve what we have for future generations to enjoy. I have so enjoyed the videos of you and Holly Hudson on Classic Design. I have watched each one several times. I hope you two collaborate again soon! Do you mean Holly Holden? she is amazing – so organised! Just yesterday I finished reading “At Home at Highclere.” I enjoyed your description and stories included in each period of time. You truly have a gift for writing and I can only say…don’t stop! Before reading each section of the book I poured a glass of wine and settled into a comfortable chair. I wanted to savor the details of each weekend and recipes, all the while imagining one or two served our next party. “Nothing succeeds like excess.” Or so I’ve heard. And of all the house parties you described I felt closest to the last, your own tale of a happy weekend. Perhaps because it sounds a bit less formal and no corsets are involved! We are eager to hear when Downton Abbey is going to return to Highclere. September sounds like a possibility, but then we hear it might not happen. Wishing you and your family all the best. I’m sure I speak for many who’ve read your books, we feel you are very “in touch” with your readers and visitors. Absolutely a fabulous video and description of the work it takes to keep Highclere going. We have been to England the last five years and not once have I been there when you are open. Are you always closed in the month of June? Someday I hope to see it. Our house was built by a shipwright in 1803 ( very modern according to British standards) but when we tore the kitchen apart the carpenters were all fascinated as they could tell that they were people who built the schooners on the Essex river and floated them down the river to Gloucester where they were fitted for the diggings and sails. Please keep up your blog. It is brilliant! I meant fitted for the rigging and sails! I wondered whether we would find oak trusses that were being re-used – ie out of a ship. This barn was seemingly built anew. Oak from Highclere was much valued and sold outside for good money. A lovely post. Very interesting. I am sure there are creature comforts needed in the house, but how lovely to restore this treasure instead ! 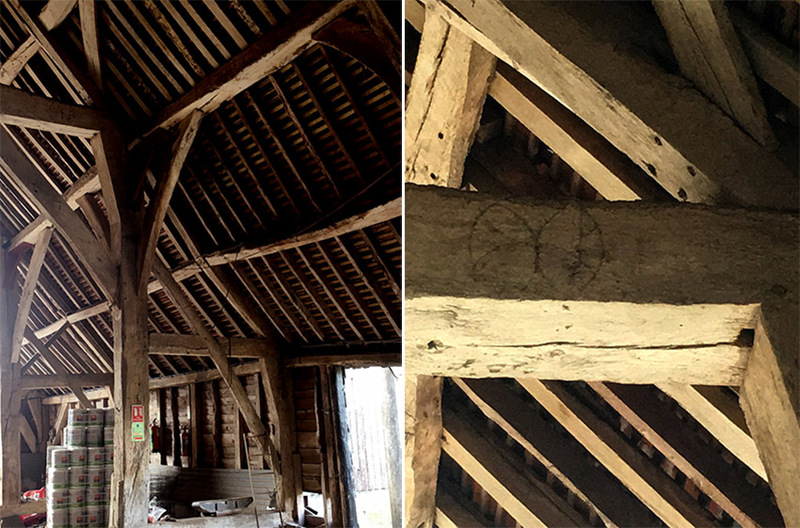 My cousin (in Herefordshire) had an old Elizabethan barn, but sadly it fell down…looking at the pictures of some of the wood rot in your post I am glad you are restoring it . It will make a wonderful venue for dancing, festivals and weddings ! Hopefully the creature comforts will come some day ! 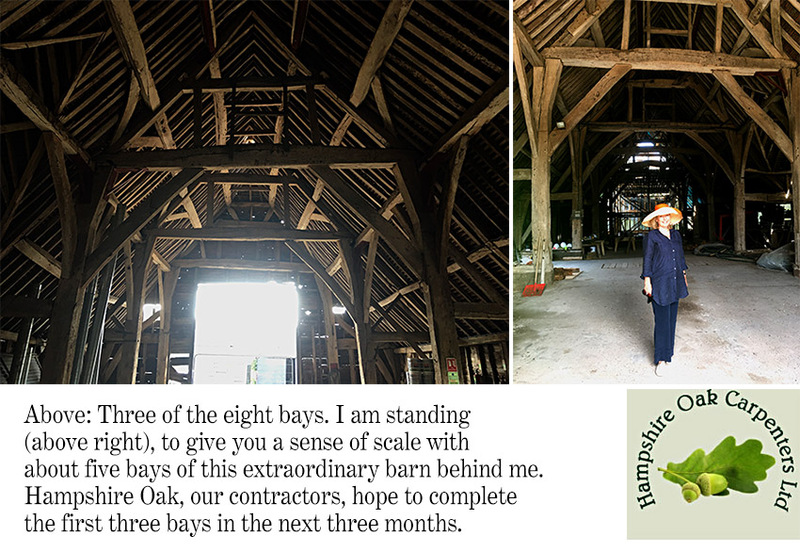 Thank you for sharing the restoration of the cathedral-barn at Highclere. I can imagine you climbing the ladder to the upper section and taking lots of pictures. Seeing the huge beams and using some of the ancient wood. The witches’ mark is fascinating!! Imagine you think about those years gone by and the tenants who managed the fields, the crops and the animals. Historic times are fascinating and should be remembered for our families, friends and children. I understand there are also many different kinds of barns in the state of Wisconsin. Thank you to Natalie Graham’s post about the Amish and Mennonite barns in York and Lancaster counties of Pennsylvania! Myrna Oakley from Oregon and North Idaho U.S.A. The wood i, in the main, being augmented – ie supported not removed. It is still ok, isn’t that rather amazing? From 1450! Thank you again for sharing your story on the restoration’s of Highclere castle, it’s grounds,as well as the building’s around it.I agree that you should write a book about the restoration of the acient barn,as it would be a good read. Please don’t give up on your blog writings, as they are very interesting to read,as well as it gives me the feeling that I am there. I enjoy very much blogs that you write. Thank you for taking such interest! A bit of inquiry revealed that her aunt was an American who married a Lord Carnarvon (presumably since 1900). She’s now a suburban American writing on Facebook. If I hated history, which I don’t, you would make me love it. What a privilege to live in such a wonderful old place! Keep up the good work, and do write about this project, please. Thank you for sharing you home, your life with us! It truly is intriguing. We had a wonderful opportunity to visit the castle in May. Everything there is beautiful. Please continue with your blog. Thank you once again. As the plains of Northern Colorado succumb to urban development, many of the grand old barns now dilapidated and falling down end up as a pile of rubble hauled off to the local landfill. Sometimes a barn, generally hardly a thing of architectural beauty or interest, will be preserved, even restored. Here few buildings are more than a hundred years old. Colorado became a state in 1876, and for us structures built back then rarely exist or have been restored to the point they barely resemble the original structure. So to see your barn, it is a an architectural wonder to have survived for so long. I have toured England twice on a bus with a group of university students and as we visited the ancient cathedrals and homes of the famous British writers–Shakespeare’s home, for example and Yorkshire Cathedral–, I was struck by several things, one was that old building survived for centuries and the other was the craftsmanship of the old buildings without the use of modern tools. I very much enjoyed this post, admiring, too your ability to overlook your fear of heights to get a job accomplished. What an amazing and interesting project. I thoroughly enjoyed reading the blog and watching (& re-watching) the video; absolutely tremendous. Working with and preserving almost 600 year old oak grown on the estate for a barn that is still standing and being preserved to head towards an 1000 year anniversary; that really is phenomenal. I’d be interested to read/hear more about the original joinery that was used in the barn’s posts and beams as well as what is currently in place, along with what is proposed for the renovations. I noticed and (like you) love the character of the bowed beams. From the photos it appeared to me that the barn has an aisled construction/framing. However, I see that you have written of the curved trusses providing the shape of a Cathedral. Does that mean that there is a combination of aisled and cruck construction in the barn? It also must fascinating watching the skilled artisans that you have engaged. The original carpenters undoubtedly worked with green oak. To restore oak that was first used 600 years ago, must require a very special skill and absolute precision. Best wishes for a successful completion of the restoration. One wonders what other interesting historical treasures will be unearthed during that process. In this medieval barn there are no ‘cruck’ frames anywhere, the barn is entirely ‘aisled’ with curves only appearing in the smaller bracing timbers. Manor Farm barn’s form employs an aisle construction method. A method of building timber framing that is designed to maximise the possible width of the internal storage space by introducing arcade posts to relieve the roof loads bearing between the external walls. My understanding is it is not cruck construction but looking up either end of the 8 bays are a pair of curved beams – – crucks – surmounted by a pair of queen posts. It therefore creates the arch in shape. Thank you very much for that information and in taking the time to provide it. `Very much appreciated.. It is my understanding that, not only do the internal posts in aisled frames relieve loads on the external walls/frames, but they in fact usually carry more structural load than the post in the exterior walls. Does that accord with your experience and this particular barn? If time permits, can you also advise on the original joinery and what the most challenging aspect of the reconstruction has been to date and/or is likely to be? Yes the arcade posts do attract more of the loads as they sit between the outside walls, however the timber bracing shores do spread some of the load back to the line of the external walls. Usually with the ‘aisle’ construction technique the arcade posts and tie beams are sized to the maximise length an oak tree trunk could physically provide, thus it was the available size of local trees that defined the limits of any particular historic barn’s overall width. To accept the structural forces the hard working arcade posts on this barn are very large in cross-section profile, generally ranging from 320mm-390mm! The original joinery is fabricated in locally sourced oak timber. This traditional timber framing building method involves an intelligent interlocking assembly of timbers at connection junctions, with inch round oak pegs ‘pinning’ the neighbouring timbers together to avoid slippage. The challenges on site are really quite numerous with this grand old building; perhaps if time permits we will at a later date add some further commentary. In the meantime we thank you for your interest in the conservation work at Highclere, and we are glad you’ve enjoyed reading about the subject on this website! Thank you very much for providing that most interesting explanation and insight into the barn’s construction and restoration. There is nothing anywhere near the age of that barn in Australia so I have been enthralled with Lady Carnarvon’s blog and video as well as your subsequent commentary on this wonderful and important project of conservation. Both you and Lady Carnarvon have provided me and fellow bloggers with a “walk through history” and for that I am extremely grateful. I also certainly would be interested in reading further commentary on your progress in due course. All the very best wishes for the rest of your work on this important project. Enjoy the weekend. What a fascinating and rewarding restoration project! Thank you for sharing such detailed photos and the informative video. The massive trusses are an absolute wonder to behold. I especially enjoyed seeing the witch’s marks etched into the wood. They add an interesting human dimension to the barn. Perhaps other marks and/or artifacts will be uncovered in the process. I’d be interested to see a documentary video on the restoration and final completion of this project. It is so rewarding to see careful preservation, not demolition. 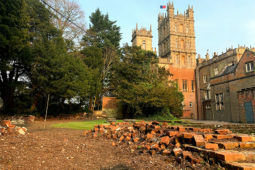 Thank you – it is going to take some time to gather our budget together but stages are manageable..
with the restoration work that is been undertaken at Highclere,it’s warms my heart to see Old buildings being restored! costing stood at around £32 million. We watched a documentary the other week with regard to how many Beautiful Country Houses were demolished after the first world war, so sad! Today I am wetting her apertite with a visit to Bampton village. I hope you have a great visit – and the sun comes out!! Beautiful home!! The sun was out all day!! Thank you for sharing your amazing home with us. I was just watching a series on Netflix titled “Taste of the Country” and couldn’t help but think of you and the post about the barn renovation. If you can get the series I am sure it will inspire you-it certainly has inspired me. Our family is now looking at purchasing a farm! I got permission to visit the barn a couple of years ago before the renovations. I would love to visitit again when the renovations are complete. All power to the landowners who still maintain these wonderful buildings.